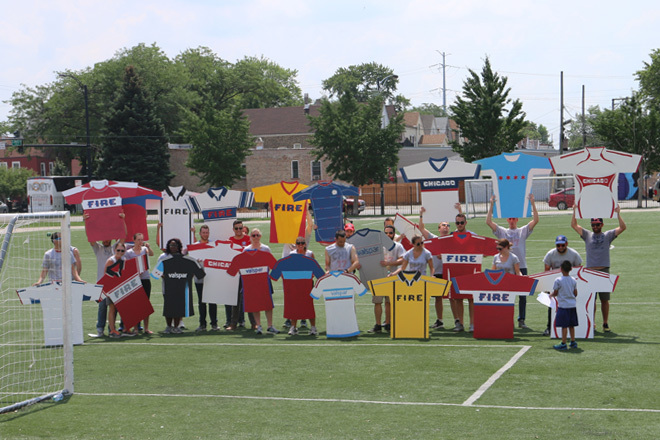 It’s been a good year for soccer in Chicago! 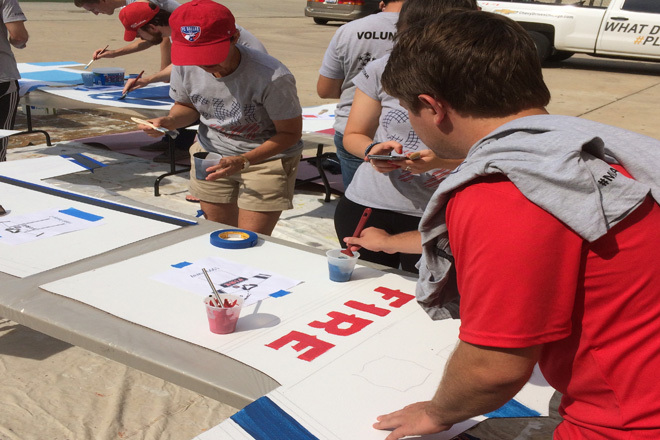 The hometown Fire at the top of the Major League Soccer standings heading into the second half of the season and it is far from over. 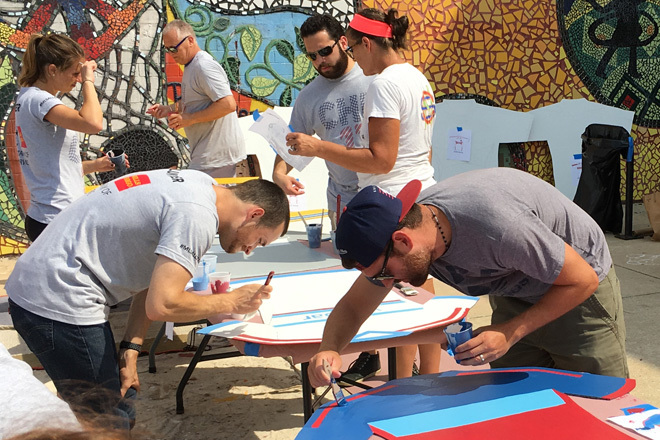 Wednesday night’s MLS All-Star Game, at Soldier Field offered up a fittingly elegant midsummer celebration of the city’s love affair with the beautiful game. 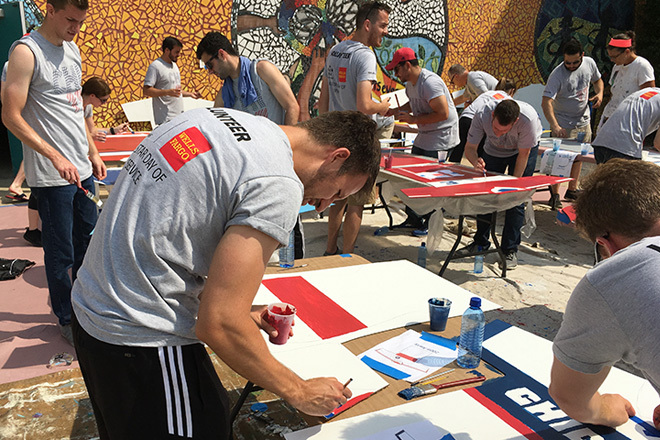 Major League Soccer players from team’s throughout the league came in to face historic Spanish side Real Madrid for the 2017 All- Star game held before a record crowd at Soldier Field Wednesday night. 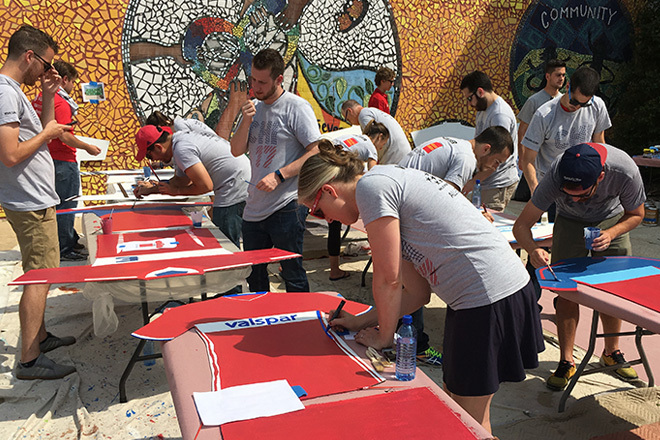 Prior to the match the Chicago Fire’s front office staff had been putting in a ton of work rolling out the welcome mat and organizing a bunch of events for the 60,000+ fans coming into the city to attend the match and take in the pre and post game festivities during MLS All-Star week. 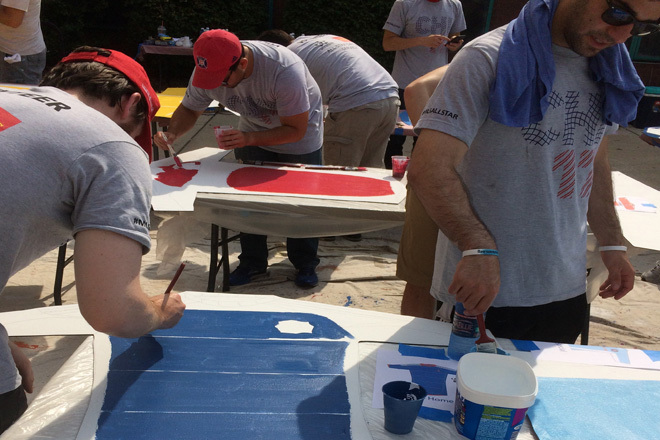 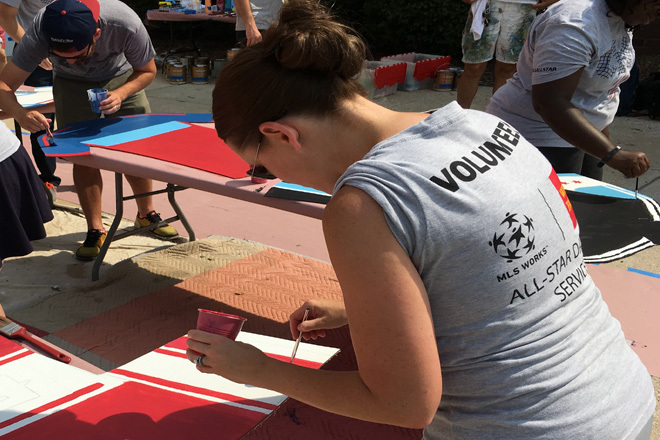 As part of the 2017 MLS All-Star week, MLS WORKS — Major League Soccer’s community outreach initiative and the Chicago Fire deemed the day of the game a community outreach day and invited fans to participate in a series of events to serve the Chicago community at large. 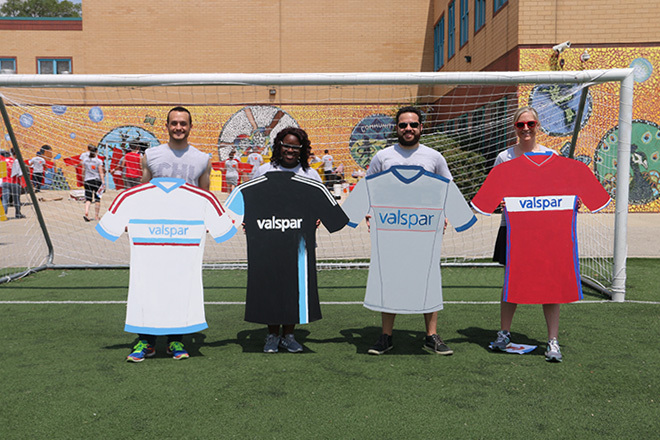 I was asked by the Chicago Fire and their title sponsor Valspar and MLS All-Star day of service sponsors Wells Fargo to come up with ideas to transform a wall via a public art piece at the combined campus of the Chicago Public Schools Josefa Ortiz de Dominguez Elementary and Gary Primary in Chicago’s Little Village. 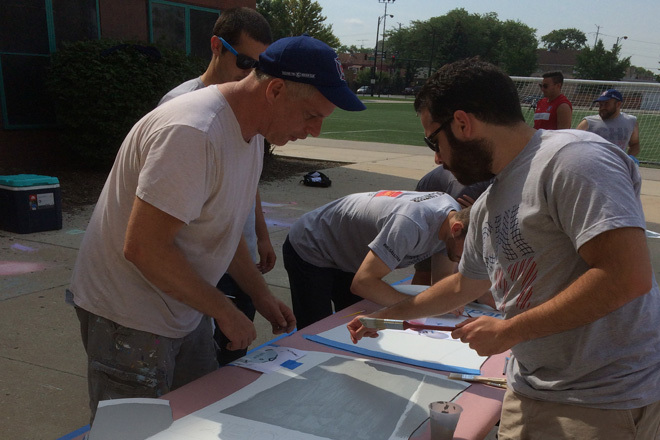 The wall overlooks a playing field that the Chicago Fire’s first team holds an in the community practice at annually while the club makes sports equipment donations to the school and surrounding charitable organizations. 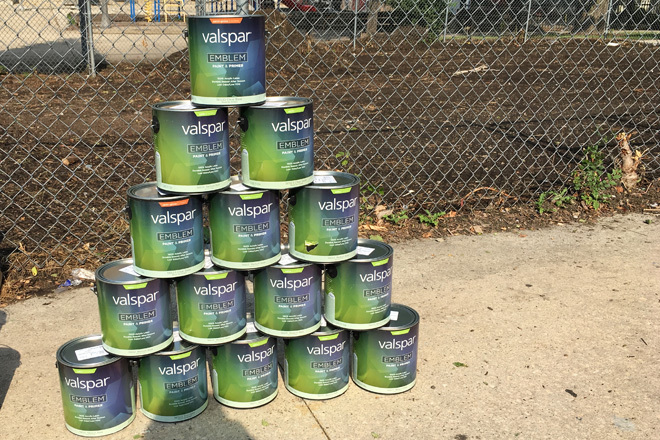 After some back and forth creative meetings, the Fire and Valspar elected to go with a unique dimensional approach to the wall I pitched. 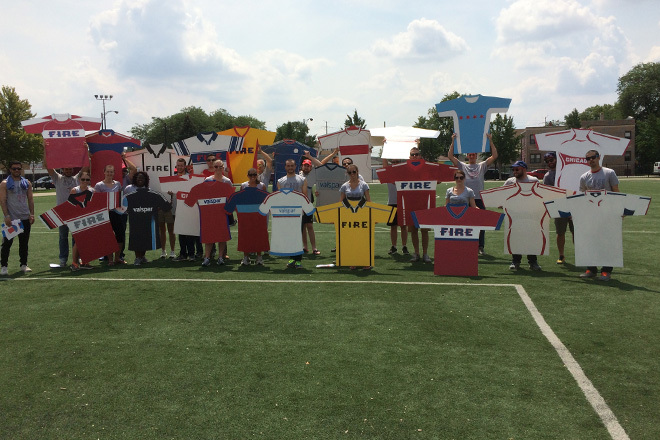 It was decided that since the 20th anniversary of the team is later this year we would celebrate the anniversary by recreating select jerseys from past seasons via hand painted dimensional cutouts. 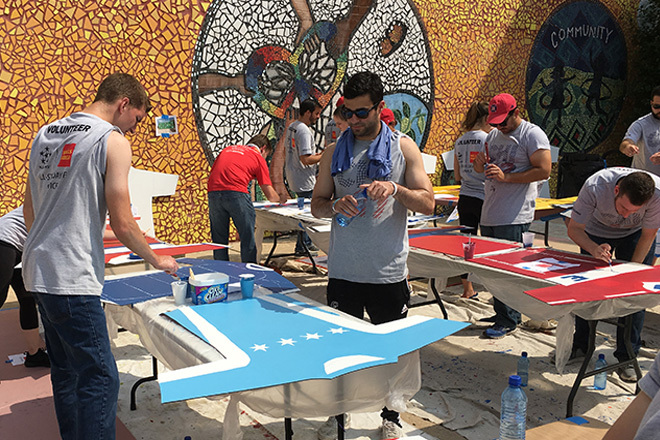 The jersey cutouts will be floated off the wall that has its background painted as a soccer field. 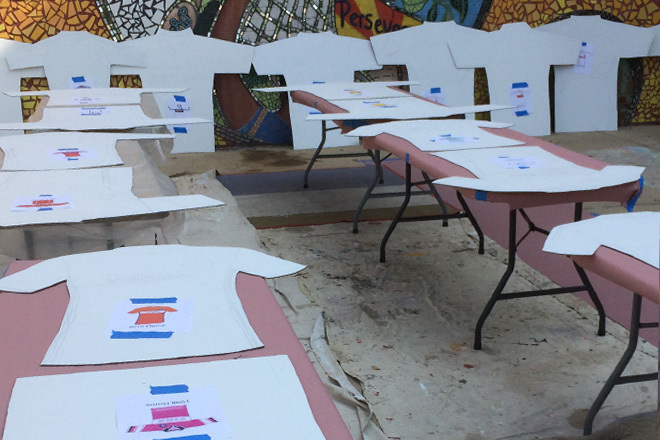 After the jerseys are added a collection of hanging plants will be mixed into the final design to give the piece a living wall component. 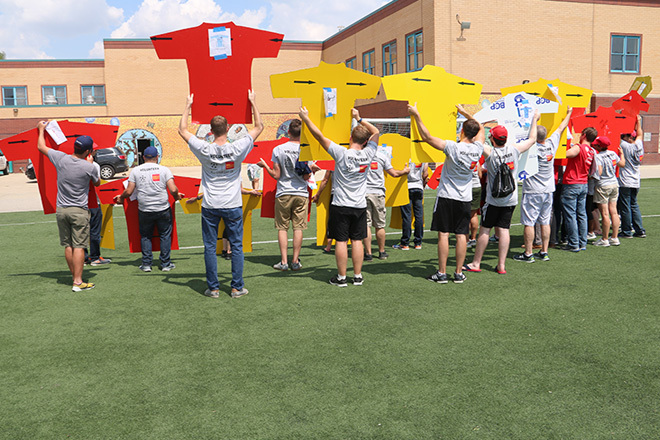 On the morning of Wednesday August 2nd, a group of volunteers comprised of fans, Fire staff and former players came in to kick off the project by painting the jerseys selected to commemorate the first 20 seasons of the Chicago Fire. 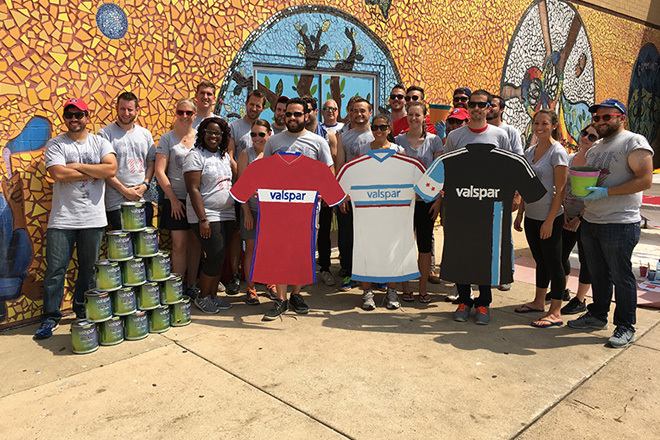 Thanks to Valspar for supplying the paint,to Wells Fargo for sponsoring the event and to the Chicago Fire and MLS for selecting me to oversee and execute this new public art project in the Little Village community of Chicago.